It seems there are new vegan products popping up in the shops every single day so here at Super Savvy Vegan we feel it is our duty to make sure we check them out for you and let you know if they are worth a try. It’s a tough job but someone has to do it! So today’s indulgence is the Freaks of Nature Cocoa Loco dessert. I found mine in Morrison’s for £2 but you can get them in Tesco, Waitrose and Ocado. As a vegan, it’s not easy to find ready made desserts we can eat from our local supermarket so it was a delight to see this in the Free From cool section. The Freaks of Nature range has been approved by the Vegan Society, Vegetarian Society and Coeliac UK. They’re totally free from gluten, dairy, eggs and soya. 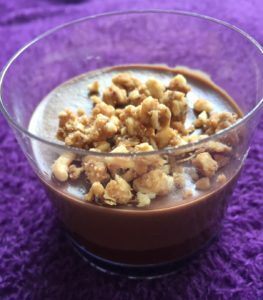 The Cocoa Loco is a little tub of decadent chocolate ganache topped with caramelised hazelnuts and really does not disappoint. You could be forgiven for thinking the 90g tub is rather dinky but it hits the spot perfectly. Anyone that knows me, knows just how much I do like my chocolate in any way, shape or form so I was quite excited about sampling this. The result….well I couldn’t manage it all at once as it’s quite rich. It is delicious though and it felt quite naughty trying it on my own! I think this would be the perfect dessert to share with a very special person at the end of a lovely meal with a glass or two of something rather special. I should add the hazelnuts are optional – you get them in a seperate little container on top to add or not to add, it’s up to you. I was a little worried about the inclusion of dates in the recipe as I’m not a fan of dates in cakes etc but I couldn’t taste them just rich chocolately smoothness so that was a bonus! So it’s a thumbs up for Freaks of Nature Cocoa Loco. I believe they also do some other plant based desserts so I’ll look out for them and let you know what they’re like or you can add a comment below with your thoughts if you beat us to it ! Enjoy. Don’t forget to subscribe to my newsletter so you don’t miss out on new vegan products like this one. Previous post: Supermarket app can save you pounds!